Where can I purchase one of these units? The Kolibri KCD-1000 is offered exclusively on our seller page through Amazon. 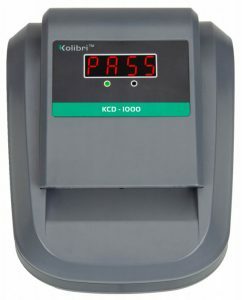 View the latest information and sales page here: Kolibri KCD-1000. Where is the serial number for my unit? What does it look like? 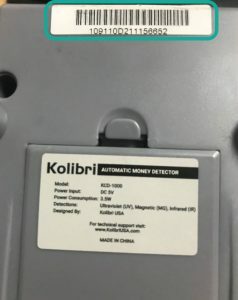 The Kolibri KCD-1000 serial number is a string of numbers and letters unique to your unit that helps us identify your product and look up information regarding this specific product. Please look to the underside of your unit for the serial number. How do I clean and maintain my unit? The below cleaning guide is available as a printable document listed in the Documents section of this page. a) Wipe away dust with a soft microfiber cloth or a soft-bristled brush. b) Clean the sensors using a can of compressed air. c) Clean the sensors with a cotton swab lightly moistened with isopropyl alcohol – gently wipe the sensors with the swab. 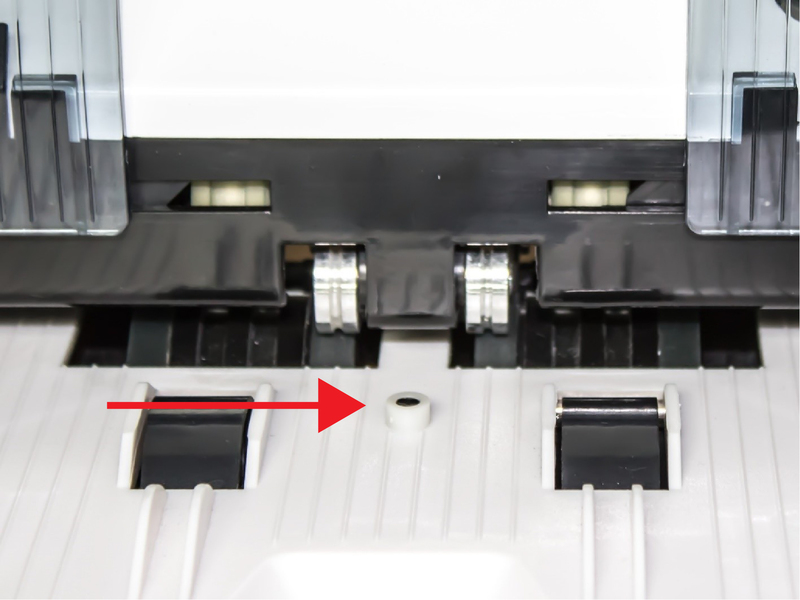 Locate the small square sensor on the upper part of the bill track as shown below. Locate the 4-part UV sensors as shown below. These pairs of sensors are spaced between the MG Sensors (metal bar). 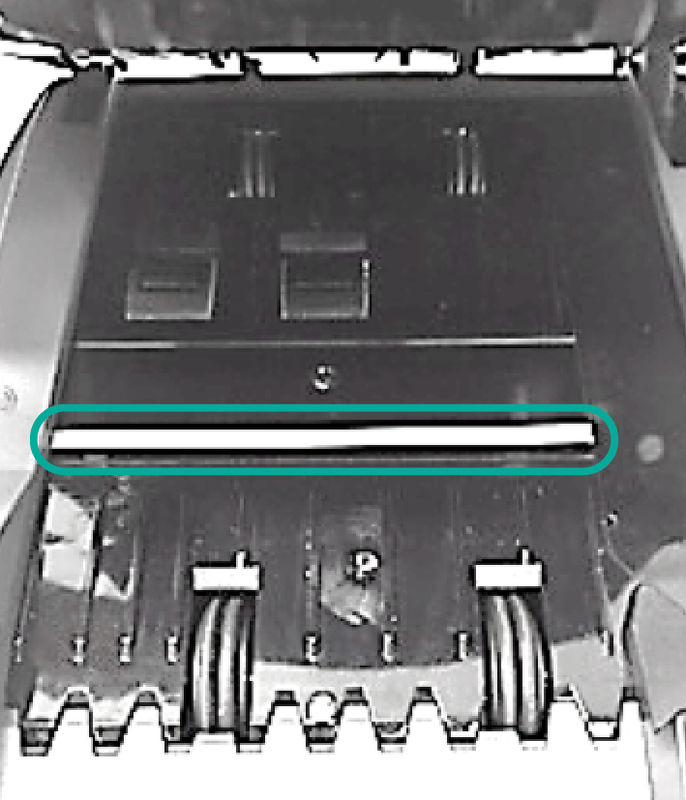 Locate the 2 magnetic sensors, which looks like a small metal bar and are found at the top middle of the bill track as shown below. Locate the 2-part start sensor as shown below. These pair of sensors are seated in the front part of the unit, between the 2 rollers. How often does my unit need to be cleaned? Kolibri suggests that the user cleans the unit at least once per week. For heavy use locations and operations, the user may clean the unit daily to avoid heavy buildup that may cause improper operation. When the unit is not in use, Kolibri suggests that the user covers the unit with a dust cover. Why does my unit jam? Bills are very worn, torn, ‘soft’, or in folded. In this situation, the bills may crumple in the bill path and get stuck. To resolve it, correct or remove the bills if they are severely wrinkled, damaged or folded. Sensors or bill path is blocked. To resolve it, turn off the unit, then open the lid. Use an air duster or soft brush to clean the interior sensors of the KCD12000. See section 5.1 ‘’MAINTENANCE’’. Look for any foreign objects inside the unit (paper clips, rubber bands, etc.). 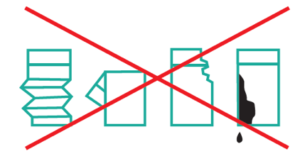 Remove foreign objects, then close the lid tightly and finally turn the unit back on. What does this problem mean? Screen displays “CEO” Ensure no foreign objects cover the sensors inside of the unit. Remove foreign objects. Close lid tightly. Turn unit on. Unit does not turn on Ensure the power cord is connected properly. Turn the switch button off for 3 seconds and turn it back on. Contact Kolibri’s technical service center if the issue persists. Unit motor/rollers keep turning Ensure the lid is properly closed. Turn off the unit and turn it back on. Contact Kolibri’s technical service center if the issue persists. Unit does not read the bills or fails to detect counterfeit Turn off the unit. Open lid. Use an air duster or soft brush to clean the interior sensors of the KCD-1000. See section 5.1 “MAINTENANCE”. Close lid tightly. Turn unit on. Bills are jammed Turn off the unit. Open lid. Use an air duster of soft brush to clean the interior sensors of the KCD-1000. See section 5.1 “MAINTENANCE”. Look for any foreign objects inside the unit (paper clips, rubber bands, etc.). Remove foreign objects. Close lid tightly. Turn unit on. Does my unit detect counterfeit notes? 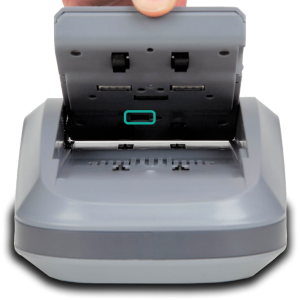 The KCD-1000 is designed to detect and flag any counterfeit notes. This unit provides UV (ultraviolet), MG (magnetic) and Infrared (IR) anti-counterfeit feature detections. To learn more about detection techniques, please refer to Section 9: What do MG, UV and IR stand for? What’s the difference? What do MG and UV stand for? What’s the difference? MG – Magnetic Feature Detection – US currency uses specific magnetic ink at exact locations to provide a unique magnetic signature on each denomination note. 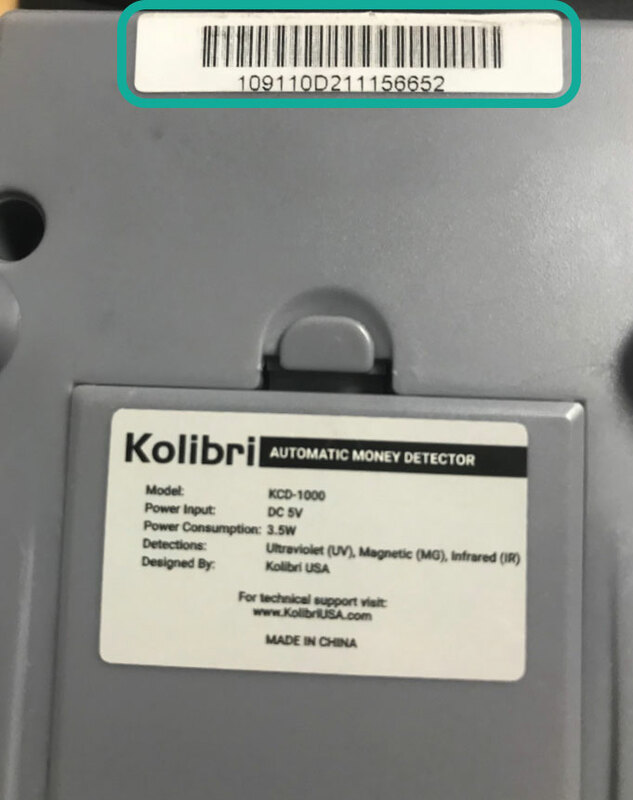 By scanning each bill for the presence and location of these features, the KCD-1000 is capable of detection the minute magnetic signals present on these bills and will flag any notes that do not have these features present, in the correct locations. Certain counterfeit notes do not have the same features and will be rejected by the KCD-1000. UV – Ultraviolet Feature Detection – Certain features are hidden to the naked eye on all US currency. In order to detect these features, the KCD-1000 has special ultraviolet emitter and receiver sensors capable of detecting the exact ultraviolet anti-counterfeit features built into each denomination note. The KCD-1000 scans each bill for the presence and accuracy of these features and fails any bills not meeting these criteria. IR – Infrared Feature Detection – Similar to UV, US currency contains hidden infrared features that can only be detected by infrared illumination and detection. The KCD-1000 scans each bill for the presence and accuracy of these features and fails any bills not meeting these criteria. What could cause false counterfeit detection? There are a few reasons that a genuine bill may be flag as suspect. Bills are inserted with slight skew causing false rejects. Make sure the bills are inserted properly, according to the section 2.3’’INSERTING THE BILL’’ of the user manual. If sensors are dirty or damaged, the unit will not be able to detect the necessary anti-counterfeit features needed to verify currency as genuine. If bills are worn, bent, torn, or crumpled, the anti-counterfeit features needed to verify a bill as genuine may be compromised. For example, the magnetic ink on a note may wear over time or heavy use, reducing the magnetic response to below detection thresholds. Does this unit recognize note value? No, the Kolibri KCD-1000 does not recognize the value of the note. The unit will not display the denomination of the scanned bill, but just PASS or FAIL depending if the bill is recognized or not. We do offer a more advanced model, KCD-2000, that uses advanced sensing to determine the denomination of the notes being scanned. Does this unit keep count of bills scanned? No, the KCD-1000 only displays PASS or FAIL depending if the bill is recognized or not. Does this unit come with a battery? The KCD-1000 does not come with a battery. Battery is currently sold separately in the US as the KCD-1000 takes 4 AA batteries to operate without plug adapter. What does the 1-year warranty cover? The warranty of this unit covers manufacturing defects, and unit related failures that occur during normal operation following the specific guideline set forth in the user manual. Kolibri is not responsible for errors or failures caused by improper use, mishandling, liquid spills on the unit, foreign object damage, units which have been opened/tampered with, or damage caused by improper maintenance, storage, or transportation. What do I do if my unit is defective when I receive it? Please contact Kolibri support through our webpage and provide a description of the failure. What information do I need to provide for a support claim? The product serial number – To find your serial number refer to Section 2: Where is the serial number for my unit? What does it look like? How do I get my unit repaired? Contact Kolibri Support through our webpage at https://kolibriusa.com/contact/ and create a support ticket. The customer service representative assigned to your ticket will respond with troubleshooting techniques, or arrange for an on-site repair at our facility. How can I reach Kolibri's customer and technical support? Please visit https://kolibriusa.com/contact/ to create a ticket. If you cannot find the support topic you need, please contact our customer service.